Intangible Cultural Heritage (ICH) NGOs have resources and competencies in various fields of ICH and often have the closest ties to communities among all other ICH stakeholders. They have great potential as platforms for strong community engagement and in that sense can be crucial partners for ICHCAP. 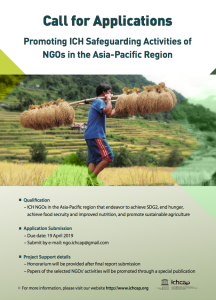 UNESCO also acknowledged the importance of NGOs in implementing the 2003 Convention, and yet there have been few NGO networks and activities in the Asia-Pacific region. To share community-based NGO activities and experiences, ICHCAP has worked with NGOs contributing to achieve the UN sustainable development goals by collecting case studies, supporting and promoting the NGOs’ activities. 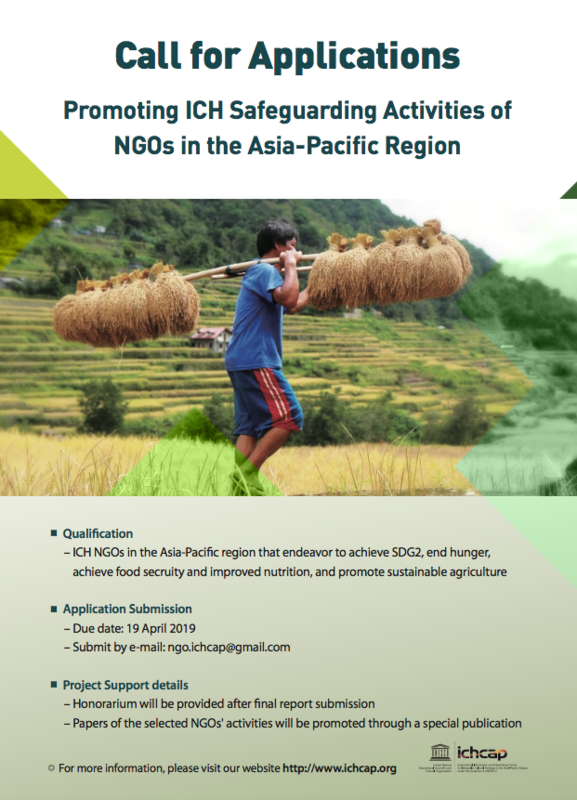 In 2019 ICHCAP would like to find ICH NGOs in the Asia-Pacific region that are working to achieve SDG 2: end hunger, achieve food security, improve nutrition, and promote sustainable agriculture. Therefore, this year ICHCAP would like to find ICH NGOs involved in the activities related to SDG 2 and share their experiences. Read the call on ICHCAP’s website.